A Fall moonrise and sunset at Kenwood at the northern end of Sonoma Valley. Add tags for "A Fall moonrise and sunset at Kenwood at the northern end of Sonoma Valley.". Be the first. 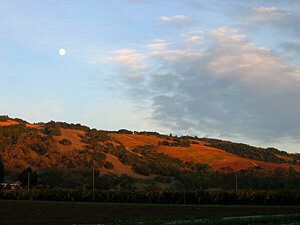 <http://www.worldcat.org/oclc/841443949> # A Fall moonrise and sunset at Kenwood at the northern end of Sonoma Valley. schema:about <http://www.worldcat.org/oclc/841443949> ; # A Fall moonrise and sunset at Kenwood at the northern end of Sonoma Valley.